It’s an upside-down situation, but much of the fish we eat — we don’t actually eat. Instead, we feed it to the fish we eat. A new study found that instead of doing that we could… you know, just eat it. 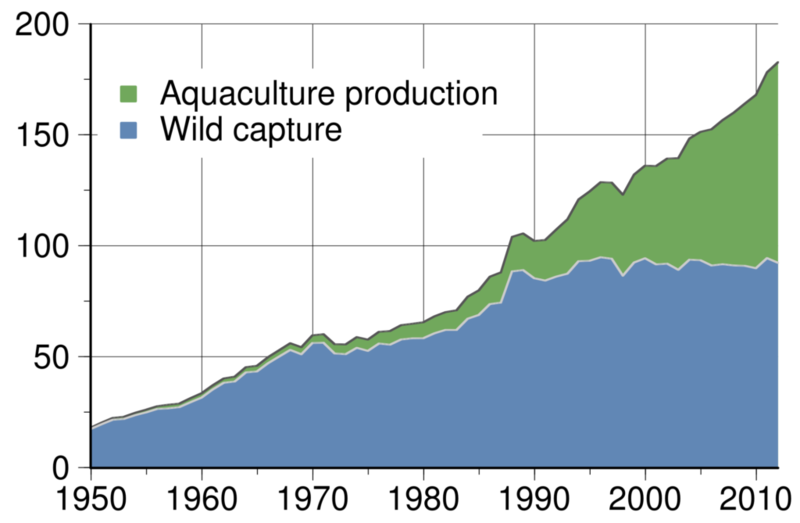 Global total wild fish capture and aquaculture production in million tonnes, as reported by the FAO. Warning: I’m gonna say ‘fish’ lots of times in this article. There’s a reason why fish is fed other fish. You know how people say fish is good for you because it contains healthy fats such as omega 3? Well, most fish we eat today comes from aquaculture, and aquaculture fish doesn’t really have the oils we’re looking for. That’s why these cultured creatures are often fed other, wild fish — especially anchovy, menhaden or herring that nobody is clamoring for, anyway. It’s truly ironic and backward, isn’t it? We want to eat fish because it has good stuff, but the fish we eat doesn’t have good stuff. So we feed the fish with the good stuff to the fish without the good stuff so we can get the good stuff. So why aren’t we doing this directly? Well, many growers will tell you that that’s not really possible, mostly for economic reasons. People don’t want to buy that kind of fish, there just isn’t a market for it. Well, this new study published on Monday in the journal Fish and Fisheries claims differently. “I was expecting there to be more truth to the argument that most of these fish don’t have a place for human consumption, that there’s generally not a market or a possibility of a market for these fish, but that’s not what we found,” says lead author Tim Cashion, research assistant at Sea Around Us, a project at the University of British Columbia’s Institute for Oceans and Fisheries. They found that out of the 20 million tons of fish destined for fishmeal production each year, 70% is destined for other fish to eat. The rest is fed to pig and chicken to speed growth and encourage the development of some nutrient. But this isn’t really necessary, and it adds a lot of unneeded pressure on already diminishing stocks. Furthermore, while many Americans often prefer shrimp and salmon, global preferences are quite different. Tilapia and carp top the preference list in China, for instance. “Species that weren’t being fed with fishmeal and fish oil before are now being fed it to supplement the diet. A good example of that is carp production in China,” says Cashion, noting that China farms the majority of aquaculture production in the world. So for starters, many of the fish that are being fed other fish don’t really need it. But the case gets even stronger, as Cashion and the rest of the team report that society’s preference for “feed” fish is also growing. Especially when it comes to herring, they found that the demand has grown significantly in recent years. But while a market may exist for this fish, there is still a problem of culture. Most people are simply more accustomed to eating salmon than sardines. Many people wouldn’t even know how to prepare sardines, and this is a big issue. As Barber told NPR, we do this a lot and not just with fish. Vegetables and cereals suffer a similar fate. So there is a market for the fish, and the market will definitely grow if we just get used to eating different types of fish. To make things even better, these fish are naturally healthy for us — they don’t need any other add-ons. We don’t think about it often, but global fisheries are in dire straits. The World Wildlife Fund and the Zoological Society of London jointly issued their “Living Blue Planet Report” on 16 September 2015, stating that 74% of worldwide stocks of the important scombridae fish such as mackerel and tuna have been depleted between 1970 and 2010. There is a strong body of research which states that globally, fisheries are under heavy stress. Overall, 53% of the world’s fisheries are fully exploited, and 32% are overexploited, depleted, or recovering from depletion. We’re managing our fish unsustainably, and feeding fish to other fish is certainly not helping.